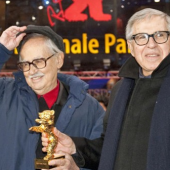 Paolo and Vittorio Taviani’s Cesare deve morire (Caesar Must Die) has become the first Italian film in over two decades to carry the Golden Bear, top prize of the Berlin Film Festival. In last night’s award ceremony, the eight-member international jury, headed by British-director Mike Leigh and featuring actors Jake Gyllenhaal and Charlotte Gainsbourg, awarded the Taviani’s docudrama the statuette. The last Italian film to receive this distinction was Marco Ferreri’s The House of Smiles in 1991. The Tavianis, best known for the films Padre Padrone, Kaos and Night of the Shooting Stars, are now in their 80s, making them likely the oldest directors to receive the award. They join the ranks of Pasolini, Antonioni and De Sica, other past Italian auteurs to receive the Golden Bear. Cesare deve morire, about a production of Shakespeare’s Julius Caesar staged in a high security prison in Rome, was one of the stronger competition entries, but divided the critics, who rallied around the Portuguese-director Miguel Gomes’ fable Tabu which won the International Critic’s Prize (FIPRESCI) for best film. Italy has not participated in the competition since Nanni Moretti’s tepidly received an award for The Mass is Over in 1986.